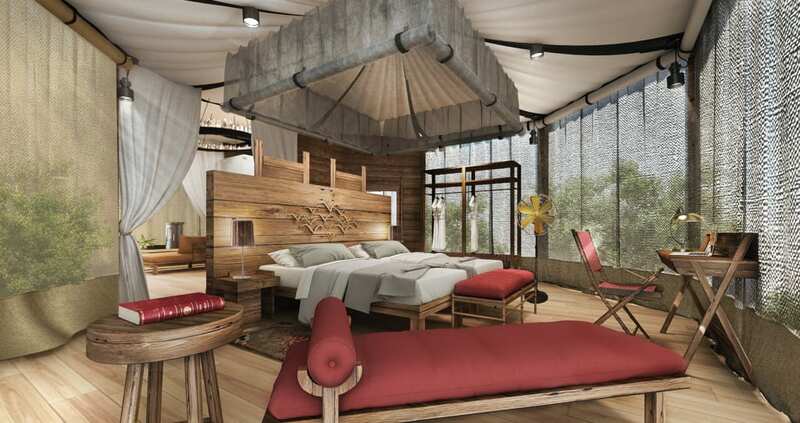 Boutique hotel group The Pavilions Hotels & Resorts has announced the opening of The Pavilions Himalayas Lake View – the first luxury tented eco-villas of their kind in Nepal, and the brand’s second property in the region alongside the award-winning The Pavilions Himalayas. Accessed via paddle boat across the majestic Phewa Lake, the eight new tented villas are oases of calm surrounded by cascading rice fields and the Annapurna Himalayas. The unique open design of the villas provides clear views of the breathtaking landscape, allowing guests to connect with nature without sacrificing luxury and comfort. Mountain botanicals and a natural spring pool form the basis of a uniquely Himalayan wellness experience, while Nepalese and international cuisine is crafted using produce cultivated at The Pavilions Himalayas’ very own organic farm. Together the hotel and farm offer employment to the local Pokhara community, reflecting the brand’s dedication to true sustainability, encompassing community outreach and low impact operating practices. Arriving at The Pavilions Himalayas Lake View is an unforgettable adventure in itself. Gliding across the picture-postcard Phewa Lake by boat, guests are mesmerised by the monumental landscapes and gentle rhythm of the boatsman’s paddle, before a short hike along a curving mountain trail brings them to their secluded lakeside haven. Jeep Safari transfers are also available on request, while the more adventurous can opt for a beautiful five-hour trek from sister hotel The Pavilions Himalayas. Embodying the laid back charm of Pokhara, the eight tented villas capture the essence of a back-to-nature experience in a truly majestic setting, without forgoing the contemporary comforts and exceptional quality of service for which The Pavilions is renowned. Guests can choose from four Classic Lake Villas (40sqm), three Grand Lake Villas (50sqm), or the capacious Royal Lake Villa (82sqm). Each has been created using natural, local materials and features floor-to-ceiling, fully retractable wraparound glass doors; handcrafted furniture; and al fresco rain showers, blurring the boundary between the interiors and their lush surroundings. While in Nepal, why not go on a trek. Read Mark Bibby Jackson’s Trekking in Nepal, Annapurna Revisited. The landscape provides endless opportunities to explore, revitalise and connect with nature. Days can be spent trekking the mountains, meditating, kayaking on the lake or joining guided walks led by a local naturalist. In between times, the clubhouse offers refreshments and local treats, while a team of therapists deliver rejuvenating wellness experiences combining foraged botanicals and traditional healing techniques. Farm-to-table dining using ingredients from The Pavilions Himalayas’ organic community farm showcases traditional Nepalese cuisine and international dishes, while mouthwatering lakeside barbecues complete the camping experience. 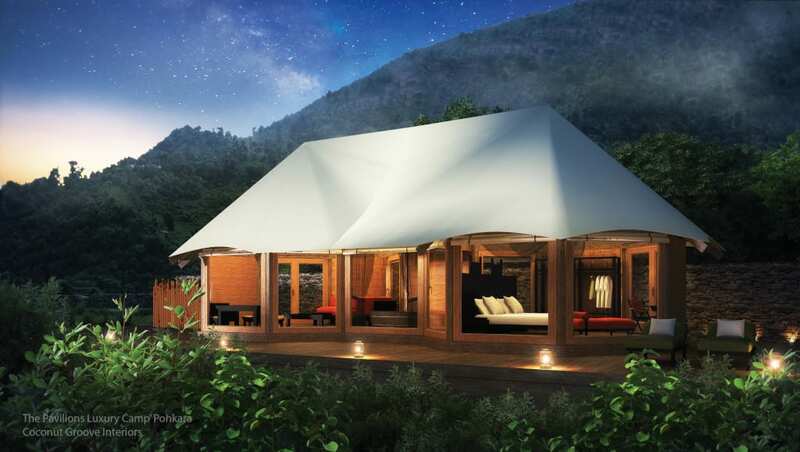 “My partner Andrzej Adaszewski and I are very excited to launch the first villa tents of their kind in Nepal. As with The Pavilions Himalayas, our philosophy is all about giving back. We do this via our three Ws: providing local, sustainable Work to the village community; Wealth, as we reinvest 50 per cent of all net profits into life-saving, life-changing opportunities for the most disadvantaged children and young people in and around Pokhara; and Wisdom, reflecting our belief that we must protect our environment by operating an ecologically sustainable business model,” says Douglas Maclagan, philanthropist and Founder of The Pavilions Himalayas. Discover more about Nepal by reading our Essential Travel Guide to Nepal Holidays for the Over 40s. The Pavilions Himalayas Lake View is offering special inclusive opening rate of US$200++ (approximately GBP158++) per person per night, including daily breakfast; lunch or dinner; a programme of activities; return airport transfers; one kayaking/rowing session; and one 30-minute signature Ayurvedic massage. For further information and reservations visit www.pavilionshotels.com/himalayas/special-opening-offer; email [email protected] or call tel: +977 6169 4379. Before setting up Travel Begins at 40, Mark was the publisher of AsiaLIFE Cambodia and a freelance travel writer. He has written the Inspector Satya trilogy novels: To Cook A Spider, Peppered Justice and Unravelling the Web (due to be published in 2019), as well as the shorts Always, A Slow Death and Sleeping Beauty. Loves walking, eating, beer, isolation and arthouse movies. Click to read our comprehensive Nepal travel guide.